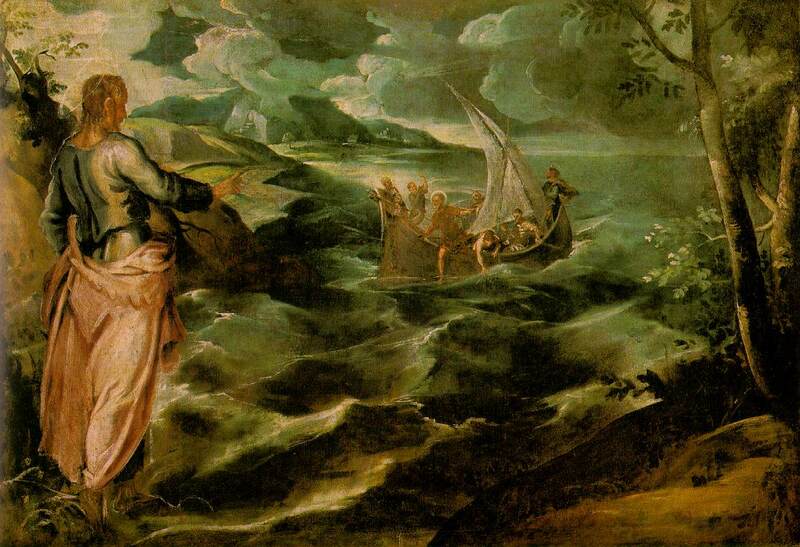 Tintoretto (Jacopo Robusti) (1518-94). Venetian painter. His nickname derives from his father's profession of dyer ( tintore ). Although he was prolific and with Veronese the most successful Venetian painter in the generation after Titian's death, little is known of his life. He is said to have trained very briefly with Titian, but the style of his immature works suggests that he may also have studied with Schiavone, Paris Bordone, or Bonifazio. Almost all his life was spent in Venice and most of his work is still in the churches or other buildings for which it was painted. He appears to have been unpopular because he was unscrupulous in procuring commissions and ready to undercut his competitors. By 1539 he was sufficiently mature to be established independently, painting pictures composed in a traditional Venetian manner with the figures arranged parallel to the picture plane and unlinked by any strong movement or variation in the arrangement ( The Adoration of the Golden Calf , Kunsthistorisches Museum, Vienna, c. 1545). His early masterpiece is the Miracle of the Slave (Accademia, Venice, 1548), in which many of the qualities of his maturity, particularly his love of foreshortening, begin to be distinguishable. To help him with the complex poses he favoured, Tintoretto used to make small wax models which he arranged on a stage and experimented on with spotlights for effects of light and shade and composition. This method of composing explains the frequent repetition in his works of the same figures seen from different angles. He was a formidable draughtsman and, according to Ridolfi, he had inscribed on his studio wall the motto `The drawing of Michelangelo and the color of Titian'. However, he was very different in spirit from either of his avowed models -- more emotive, using vivid exaggerations of light and movement. His drawings, unlike Michelangelo's detailed life studies, are brilliant, rapid notations, bristling with energy, and his color is more sombre and mystical than Titian's. Tintoretto's greatest works are the vast series of paintings he did for the Scuola di San Rocco from 1565 to 1587 -- scenes from the life of Christ in the upper hall and scenes from the life of the Virgin in the lower hall. The complicated system, starting in the upper hall, was probably not conceived by Tintoretto himself, but he interpreted it with a vividness and economy of color and detail which gives a miraculous cohesion to the whole scheme. Its personal conception of the sacred story overwhelmed Ruskin, who devoted eloquent pages to it, and Henry James wrote of the stupendous Crucifixion : `Surely no single picture in the world contains more of human life: there is everything in it, including the most exquisite beauty.' The unorthodox rough brushwork incurred the censure of Vasari, but later generations recognized it as a means of heightening the drama and tension. As well as religious works, Tintoretto painted mythological scenes and he was also a fine portraitist, particularly of old men (a self-portrait in old age is in the Louvre). Some of the weaker portraits that go under his name may be the product of his large workshop. His son Domenico (c. 1560-1635) became his foreman and is said to have painted many portraits, although none can be attributed to him with certainty. Another son, Marco (1561-1637), and a daughter, Marietta (1556-90), were among his other assistants. 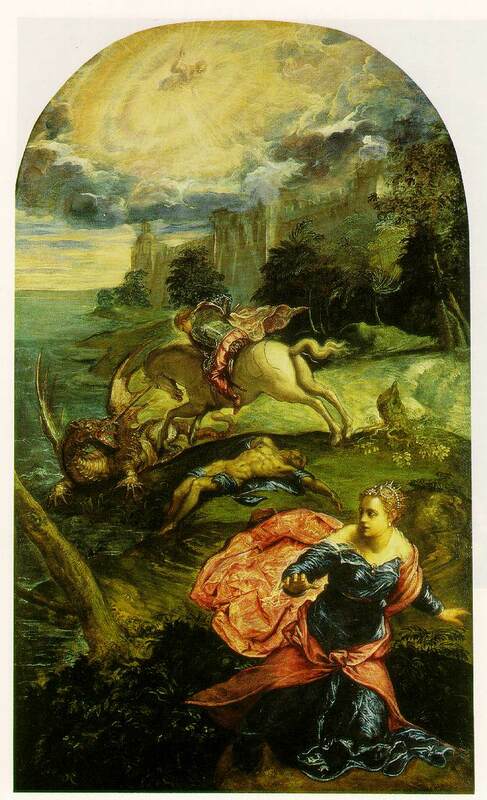 The later paintings can thus be divided into those which are largely studio productions on the one hand and the visionary inspirations from Tintoretto's own hand on the other. A prime example of the latter is The Last Supper (S. Giorgio Maggiore, Venice, 1592-94), the culmination of a lifetime's development of this subject, from the traditional frontal representation to this startling diagonally viewed composition. Tintoretto had great influence on Venetian painting, but the artist who most fruitfully absorbed the visionary energy and intensity of his work was El Greco.